In my first step towards combating Summer Heat, I chose an oil control face wash that would keep me away from looking like a shiny object and from acne too. Tea Tree Oil Control face wash contains precious herbs and botanical extracts specially developed exclusively for oily and sensitive skin.It deep cleanses skin, removes excessive oil and also helps to control acne and pimples. Method of use : Moisten Face.Squeeze out a small amount on your palm. Massage gently on the face and neck. Rinse well and pat dry. Ingredients : Tea Tree extract, lemon extract, Vitamin E, Olivem. Shelf Life : Best before 3 years from the date of manufacturing. I have a combination skin where my T zone is quite oily & the rest of my face being normal. I neither prefer very dry skin because it can cause wrinkles nor too oily skin which I am sure no one wants. I actually bought this face wash for my husband who has extremely oily skin(praises self for being such a responsible wife), but then eventually I too started using it once a day when I am back from work. 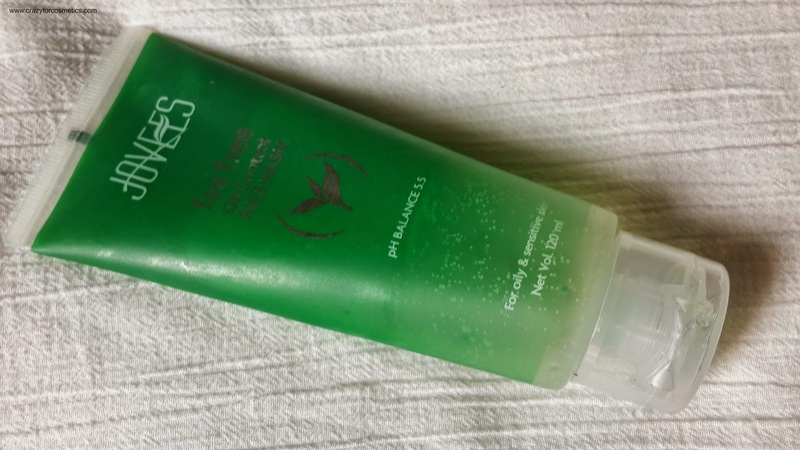 The face wash comes in a opaque light green tube and it is quite sturdy. 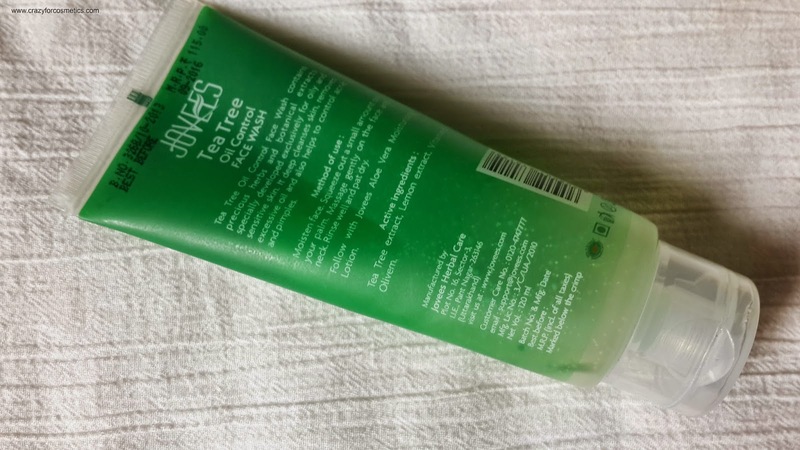 The texture of the face wash is quite runny with minute green and white beads which dissolve while scrubbing. 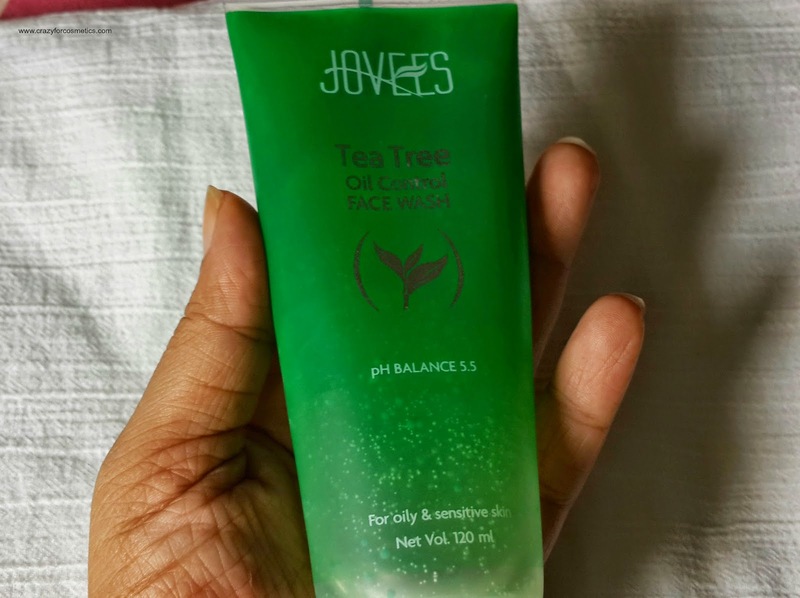 The total quantity is 120 ml and is priced at INR 115.The smell is more medicinal in nature and the product lathers very well.It does not have any tingling effect unlike some products that I have used but the end result is quite promising.The skin looks bright, clean and soft after using the face wash. It helps me clean up all the accumulated dirt and oil from my face. I feel refreshed after using this face wash. It reads pH 5.5 which I think makes the skin's pH neutral and it is good. Those who have extremely oily skin can use it twice a day for good results and those with combination or dry skin can restrict the usage to once in 2 days or follow it up with an oil free moisturizer if using it daily. I definitely recommend this face wash for the summer. It keeps you fresh and bright. Rating : 4.75/5 , since the texture is too runny and you might waste a lot of product while squeezing it out from the tube.